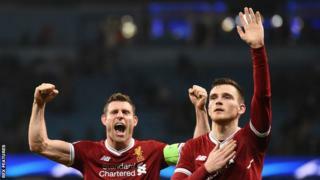 Liverpool duo James Milner and Andy Robertson celebrate after helping Liverpool reach the semi-finals of the Champions League for the first time since 2008Liverpool will not be scared of anyone left in the Champions League but the team I think they would prefer to avoid in the semi-finals is Real Madrid.Realistically, after knocking out Manchester City 5-1 on aggregate, you would now put Jurgen Klopp's side as second favourites behind Real to win the tournament - well, I would anyway.Real have been there, done it and bought the T-shirt so they know what it takes to win the Champions League on a regular basis, and seeing Barcelona go out will give them an extra spring to think they can win it for a third straight year. In a one-off game like the final in Kiev, I definitely think Liverpool can beat Real but, over two legs, it will be a lot harder and I hope they get someone else in the draw. Cristiano Ronaldo scored a stunning overhead kick to help Real build a big first-leg advantage over JuventusFrom what I have seen of the teams that Liverpool could get next after their impressive win over Manchester City, Roma or Bayern Munich would be a good draw for them.None of the remaining teams will be in their face like City were, so Liverpool are going to have far more of a tactical battle whoever they get, but Roma in particular have a slow tempo which would suit the way they play. Roma would play a very calculated game to try to catch the Reds on the break and the Stadio Olimpico is an intimidating arena, but I still think Liverpool's energy would be too much for the Italian side. By beating Barca, Roma have been the surprise package but, let's be honest, they are not a great team, just a good one that is in great form. Roma are in the semi-finals of Europe's premier competition for the first since since 1984 - when Liverpool beat them on penalties in the final at Stadio OlimpicoBayern have to get past Sevilla on Wednesday in order to reach the semi-finals, and I would not say that it is a done deal.Sevilla lost at home in the first leg of their quarter-final but they created numerous chances and it was quite ridiculous how many goals they could have scored, but didn't.In the end, Bayern punished them because they have still got quality players, but they are not the side they were two or three years ago.Real also have to finish the job in their quarter-final with Juventus but, after winning 3-0 in Turin last week, I think we can safely say they will go through. City, whose heat map is shown on the left, had 70% of possession in the first half at Etihad Stadium as they piled on the pressure but only managed to score one goal. Klopp said afterwards that his Liverpool team "came through the whirlwind"I actually feel like any of those teams could go on and win it, because they are all in form and they will all be full of confidence - everyone is when they get to this stage, because they all think their name is on the trophy. I know I did when I was here with Marseille.When you are talking about reasons why Liverpool can go all the way, then we all know about their attack and how dangerous it is.But defensively they showed a different side to their team in both legs against City, compared to what you might expect. Apart from their goal, City only had two other shots on target (green arrows in the graphic on the left), both from outside the area. They managed five shots off target (red arrows) and saw 12 of their 20 shots blocked. Pep Guardiola's side put in 27 crosses from open play (right-hand graphic) but none of them were successfulYes, in the final third on Tuesday, City were the poorest I have seen so far this season, but some of the credit for that has to go to Liverpool.They were disciplined at the back and they got their defensive lines right under intense pressure in the first half.Liverpool were high when they had to be and they were deep when they had to be too. They also packed the box and dealt with all the crosses that City put into their area.It soon became clear that City had to cross the ball with pace to cause them any issues because if they hung the ball up in the air then Virgil van Dijk and Dejan Lovren would deal with them comfortably.Lovren gets a lot of criticism but he was excellent throughout and I thought he was probably the better of Liverpool's two centre-halves. One of the things Liverpool have got going for them at the moment is that they have got a bit of resilience. They also have a good shape about them, and that prolific front three of Roberto Firmino, Sadio Mane and Mohamed Salah.In goal, Loris Karius has really come on in the past month or so after being given a run in the team. He has been excellent, which is important because they have had problems in that position for a while.And, while their defence is looking tighter at the moment too, it is not at the expense of their attacking play.They still look like they are an exciting, attacking side and, if you give them chances, they will take them - as they showed across both legs against City.Salah's goal to make it 1-1 in the second leg was a great finish. I actually thought City dealt with him well but he still scored, while Firmino made his goal look easy.Yes, you need a bit of luck to progress in cup competitions, and Liverpool got a slice when Leroy Sane's goal was wrongly ruled out for offside at the end of the first half.But that was not the reason they went through. The thing about Liverpool which is so impressive is that whatever game they are playing in, and whoever the opponents are, you can see them scoring. Klopp has been in charge at Anfield since October 2015 - he took the Reds to the finals of the Europa League and League Cup in 2016 but lost on both occasions. In his two seasons in charge, he has finished eighth and fourth in the Premier LeagueThe other big positive for Liverpool is Klopp himself. He has come in for a bit of stick in the past but he showed what a good manager he is by getting his side through this tie.He got his tactics right and I like him because he plays the game the right way, but his man-management is also a big part of his approach.Klopp definitely gets the best out of his players - you cannot say any Liverpool players shirk responsibility because they all stand up and give everything they have got for him.He has a great relationship with the fans too, despite having a couple of sticky periods when Liverpool were losing games.All teams go through those times, though - just look at City now - and Klopp has got it right at the moment.True, he could get knocked out in the semi-finals of the Champions League and finish fourth in the Premier League and everyone will probably say he is rubbish, but I think you would still have to recognise the progress that Liverpool have made under him this year. Klopp does need to win a trophy at Liverpool soon, however. Like Mauricio Pochettino at Tottenham, people will forever ask questions about him until he does.Liverpool have shown how good they are by beating City three times this season but Klopp does not have the depth in his squad to see them challenge for the title at the moment.He needs to add four quality players to change that and close the gap, because you get found out over the course of the season if your squad is not strong enough.It is different in knock-out competitions and, let's be honest, Liverpool are a cup side at the moment - when they are at their best they can beat anyone in a one-off situation.That is why so many people think they can win the Champions League, and I am sure Klopp does too.Chris Waddle was speaking to BBC Sport's Chris Bevan.